Thanks to your participation, our first Wolfram Mathematica Virtual Conference was a success. Again, thank you for your support, and we hope to see you at our next event. Wolfram Mathematica Virtual Conference Recordings Are Now Available. Thousands of attendees from 95 countries joined our experts at the first-ever Wolfram Mathematica Virtual Conference 2011 to experience a new way to learn about Wolfram technologies. Even if you missed the conference, you can watch recordings of the presentations. Learn from Mathematica experts. From Mathematica novice to experienced user—and from engineering or finance to image processing, research, and education—this free virtual conference will help you get the most out of the Mathematica platform. Whether you're brand-new to Mathematica or haven't used it in a while, see how its integration and automation make it easy to use across fields and without add-ons. Discover what makes Mathematica the most complete compute-develop-deploy system. Hundreds of capabilities get added to Mathematica every year—the fastest rate of development in the industry. Find out from the developers what's new, how you can apply it, and how to get the most out of Mathematica. From start-up to Fortune 500 and everything in between, Mathematica powers innovation across all industries and application areas. See how it can give you an edge in fields such as computational finance, image processing, multi-engineering systems modeling, and more. Across the world and all educational levels, Mathematica is used by students, teachers, and researchers alike. Educational experts will show you how to get started or further enhance your application of Wolfram technology in the classroom and beyond—from mobile devices to large-scale clusters. 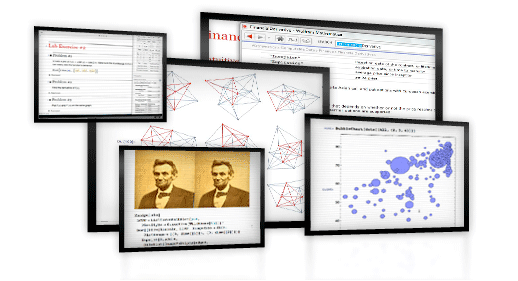 More than just a computational tool, Mathematica is used for developing interactive reports, courseware, textbooks, prototypes, applications, and infrastructure software. Our experts will demonstrate how the Mathematica platform can streamline not only your development, but also your distribution process.